Cessna Aircraft's Citation Mustang received full type certification Friday, clearing the way for customer deliveries. It's the first jet among a new class of small airplanes called "very light jets" to receive full type certification from the Federal Aviation Administration. Cessna has orders for 250 of the $2.6 million six-seat jet. Production is sold out into 2009. Eclipse 500 first certified VLJ – At EAA AirVenture Oshkosh 2006 this summer, FAA Administrator Marion Blakey awarded Vern Raburn, Eclipse Aviation’s president and CEO the provisional Type Certificate for the Eclipse 500 VLJ. 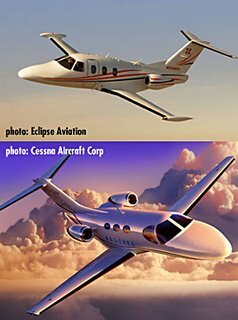 The key word in the Eclipse release back in July was of course, “provisional”, so yes, Cessna wins on a technicality because their TC is a full one. But in five years, when VLJs are everywhere, will it really matter who was awarded the first TC? Apparently, the answer to that is yes, at least in Kansas.